a fork, a drainer or strainer, ice water or cold water, and mixing bowl. Pickled beets make a nice side dish with grilled meat, or a colorful addition to a summer salad buffet or relish tray. Watch out that the beet juice doesn't stain your hands or clothes, though! It's strong stuff, and the best way to prevent stains is to handle beets under running water in a clean sink. First, get a pot of water boiling. Over the sink, cut off all but the closest inch or two of stems and leaves from the beet itself, and discard or compost. Either leave the root as is, or cut it to within an inch of the bottom of the beet. Scrub the beets with your hands under running water to remove all dirt. Don't worry if they are not a pretty color. They will be! If you have a steamer, place the prepared beets in it and lower it over the water. If not, just plunk the beets into the boiling water. After 20-30 minutes, check to see if a fork will go easily into a beet. If not, keep boiling for a few more minutes and try again. Drain. Plunge into ice water or cold water. 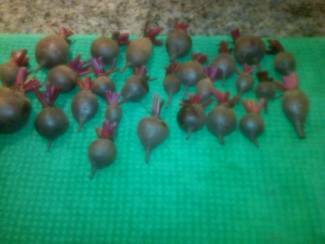 When the beets have cooled enough to handle, pick them up one by one over the sink, under running water, and push away the peel with your fingers. Discard or compost the peel. You will be left with a smooth, shiny, slippery, dark red beet. Now you can slice each beat or cut them into bite-sized chunks. Make a pickling juice with the other ingredients listed above, and marinate (let stand) the beets in the juice for a half-hour at room temperature.